Milford Sound as described by the sealer John Boultbee in 1826. The dramatic backdrop of Milford Sound. This is one of the iconic New Zealand experiences. 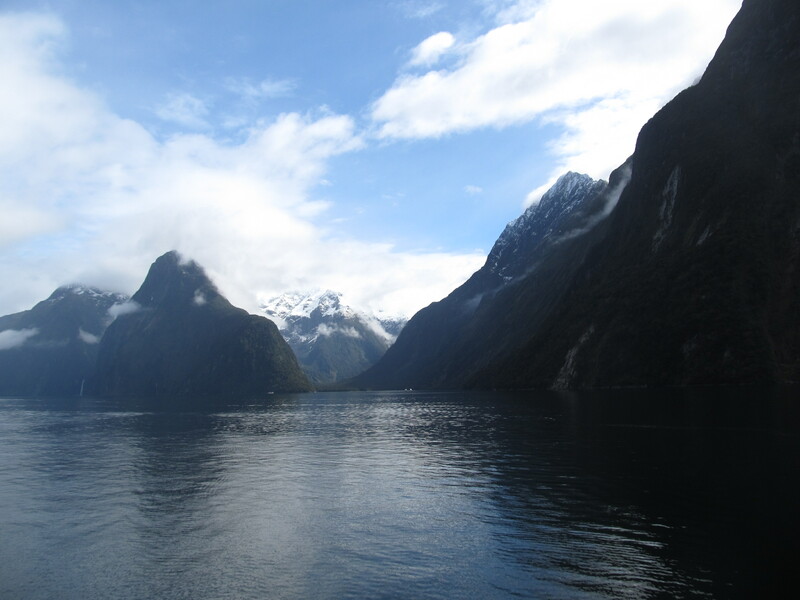 Milford Sound is peaceful, picturesque (weather permitting) and teeming with wildlife. A cruise on the sound will set you back close to $100NZD but it’s hard to put a price on the beauty and tranquillity of the surrounding mountains, waters and waterfalls. We opted for the nature cruise which includes more time with any wildlife you spot and an informative commentary. To be honest, I don’t think we got our money’s worth on this one as the commentary was minimal and I could have told you most of the animal facts myself (and I’m no expert). 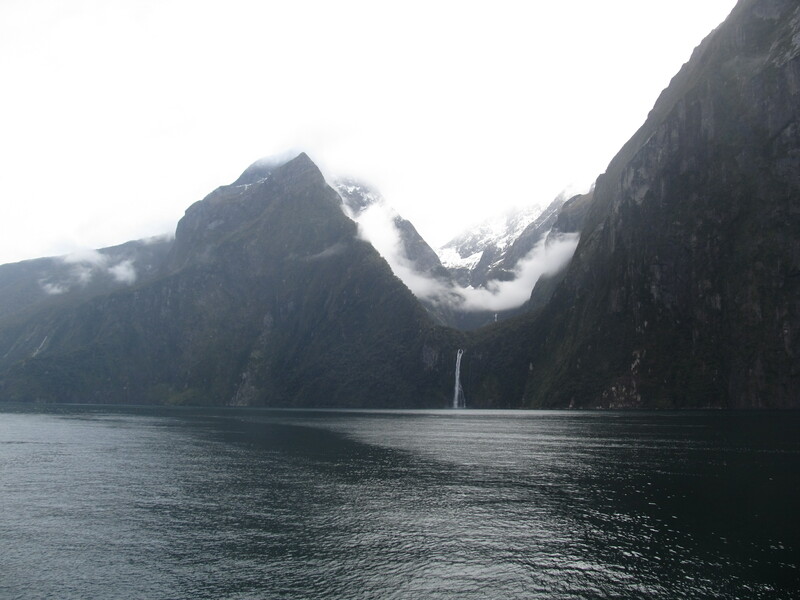 Milford Sound is actually not a sound at all but a fiord. The confusion came about because when Milford was discovered during the early 19th century the Norwegian word ‘fiord’ did not exist in the English language. A ‘sound’ is a river valley that has been flooded by rising sea levels or a depression in the land. A ‘fiord’, on the other hand, is an ice-carved valley which was flooded by the sea after the glacier’s retreat and this is what happened at Milford. Glacier-carved hanging valley and waterfall. There is evidence of the glaciation that occurred a few million years ago all around the water’s edge in the form of waterfalls, hanging valleys and steep-sided valley walls. Stirling Falls is the most impressive waterfall in the fiord and spills out of an archetypal hanging valley, eroded by the glacier as it moved through the valley. Cool temperate rainforest cloaks the mountains around Milford Sound. Evergreen beech trees are the most common species as they are well-suited to the area’s wet climate. Bellbirds chirrup amongst the branches amid the gurgling sound of waterfalls. Along with its natural beauty, Milford Sound offers much in the way of wildlife. Sumptuously green Kea birds, the only species of alpine parrot in the world, are frequently sighted on the roads to and from Milford. They seem to have a fascination with cars. On our cruise we were fortunate enough to see a Fiordland Crested Penguin bobbing in the water next to the boat. This is one of the rarest types of penguin in the world, with a population of about 4,000 living in the wild. They nest in the fiord between October and December each year. New Zealand Fur Seals, Milford Sound. 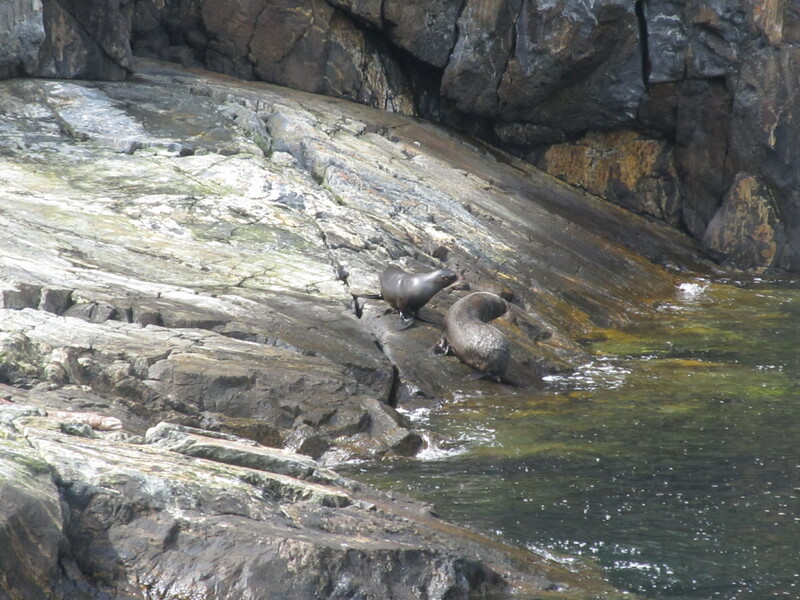 You’d be unlucky not to see a New Zealand Fur Seal on your visit to Milford Sound. They can be spotted sparring on the rocks or enjoying a quiet snooze. More of a special sight is the dolphins, usually bottlenose, that occasionally swim here. The Maoris say that the god Tu-Te-Raki-Whanoa created New Zealand’s fiordland coastline using his adze. He worked his way up from the south to the north, initially carving a rugged and jagged landscape. By the time he got to Milford Sound though, he had honed his carving skills. Piopiotahi (Milford Sound) is considered to be his finest work and is also the final fiord he created to shelter the wild sea. 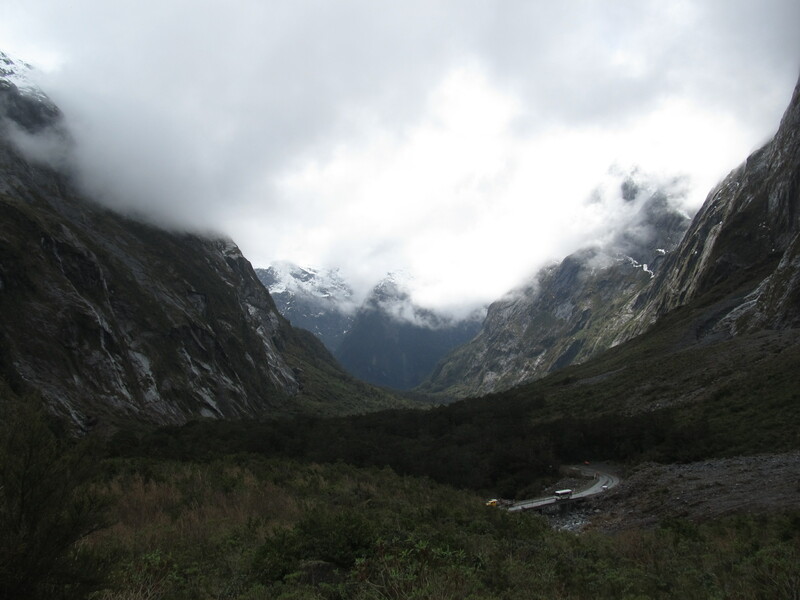 Glaciated landscape around Milford Sound.